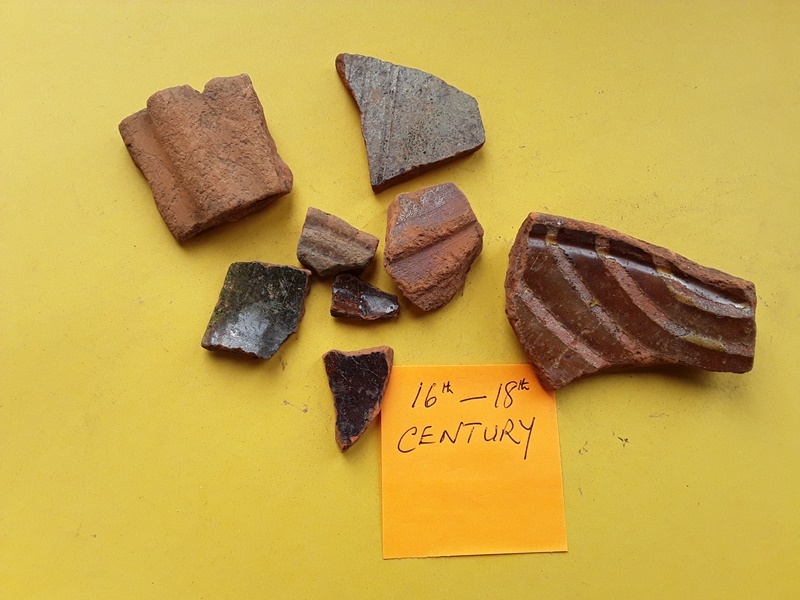 We have seen here some of the back garden pottery finds (sherds) that link Ellingham and Kirby Cane to the Romans. 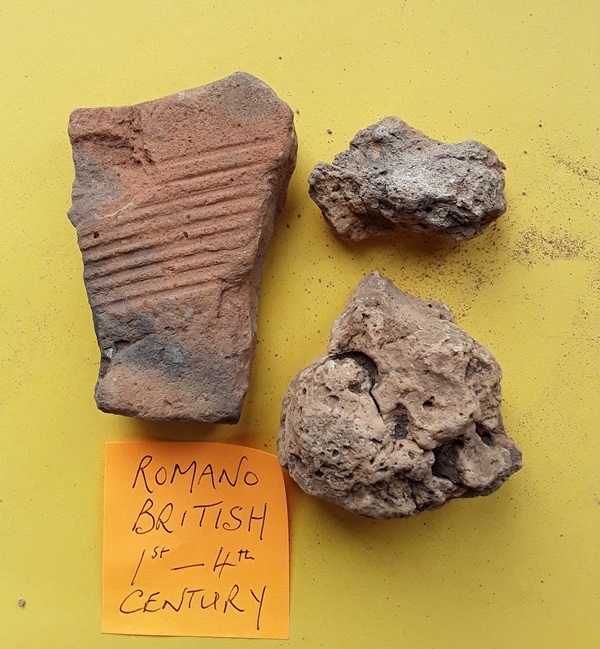 Here are some more pottery sherds from one smallish back garden in Kirby Cane covering a huge chunk of our history from the 1st century right through to the 18th century. Do you have anything like this in your back garden? If so, please make contact. Note: All of the finds were identified and dated by experts at Norwich Castle Museum. 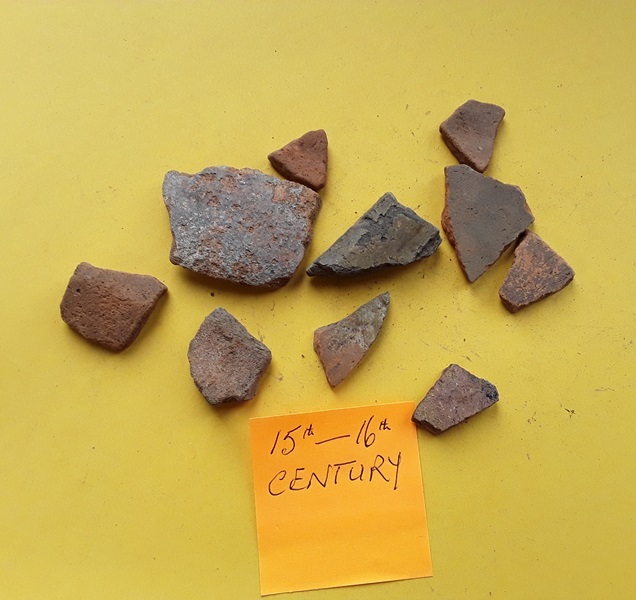 The scale of the sherds can be assessed by the orange post-it which is 5cm square. 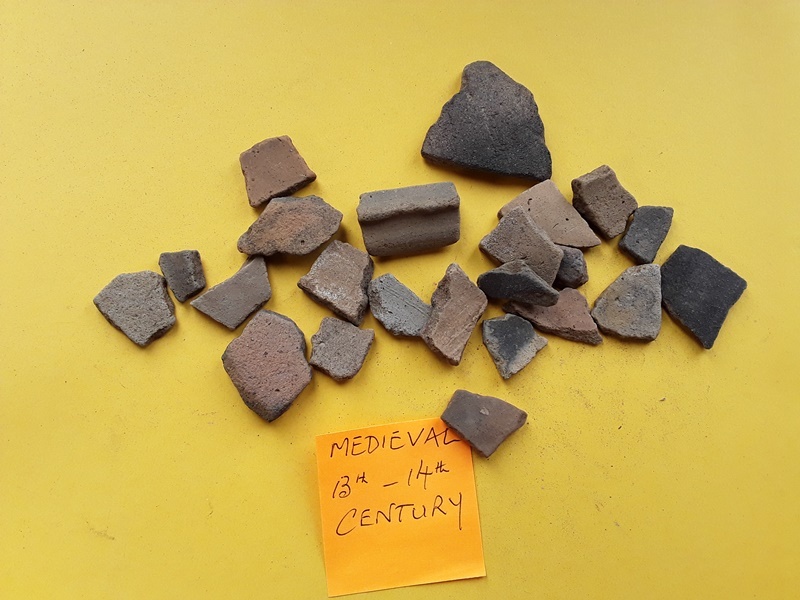 Remember too that there are links to the Norfolk Heritage website that shows all of the recorded archaeological finds from the two villages; Kirby Cane here and Ellingham here. 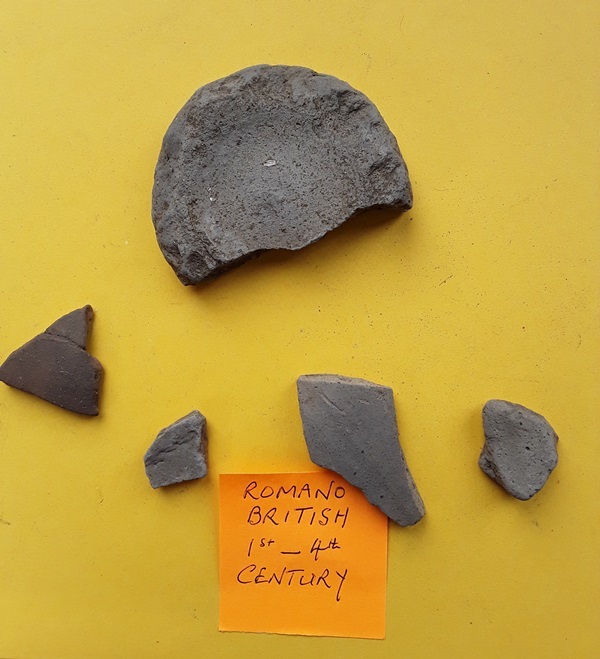 This shows Romano British greyware pottery from the Roman occupation. Remember, this country was occupied/colonised by the Romans for over three hundred years. From the early incursions of Julius Caesar in AD 55 and AD 54 until the Roman Empire came under attack from all sides in Europe in AD 410. Being easily approached from the coast and the river our two villages were ideal for settlement. There was a major Roman settlement at Scole with quay headings so we know that the Roman boats came past here. We should ask perhaps; where is the Roman Villa? 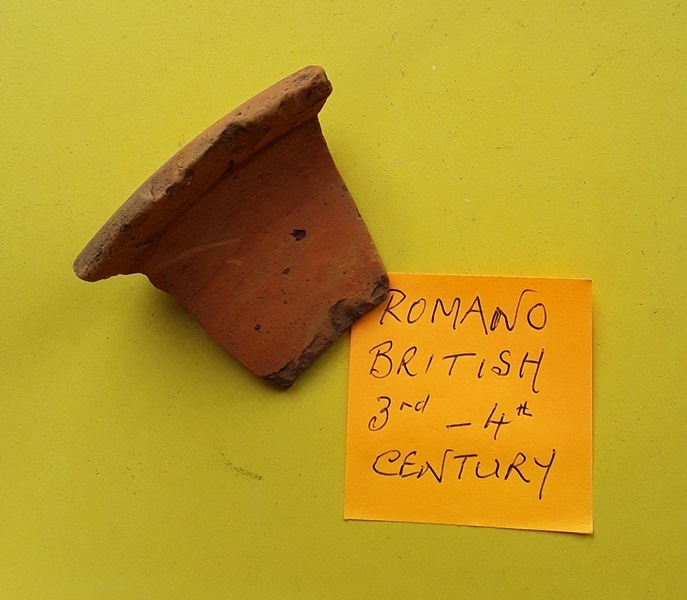 Travel and trade in Roman times can be traced through the objects that are found and we know that some of the Ellingham kiln pottery has been found as far away as Newcastle. Here is a sherd of a bowl rim that was made in Oxfordshire. It is interesting to think on how this piece got to Kirby Cane and what the lives of the people who brought it here were like. It was incursions by the Saxons and Vikings that helped to bring an end to the Roman occupation of our country. By the 5th century these new migrants had established themselves across many parts of the East. 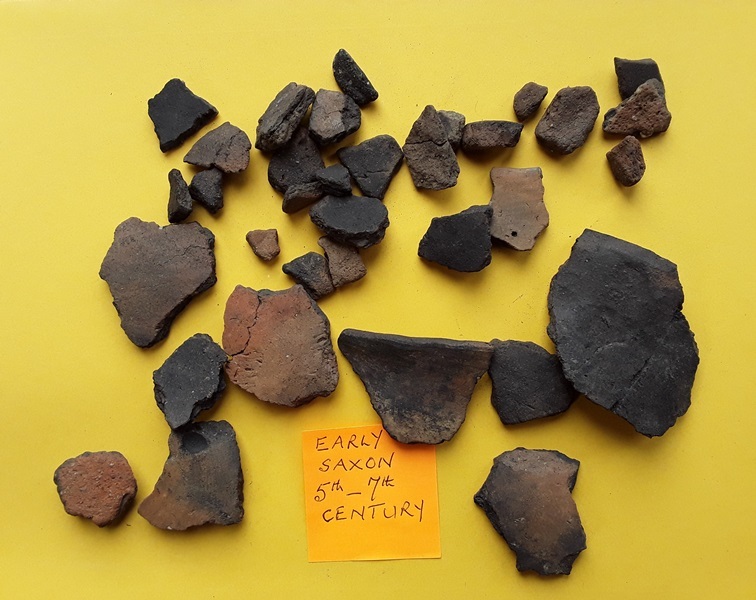 So here we have pottery that comes from the time of the Wuffingas dynasty; the time of Sutton Hoo and the ship burials there. 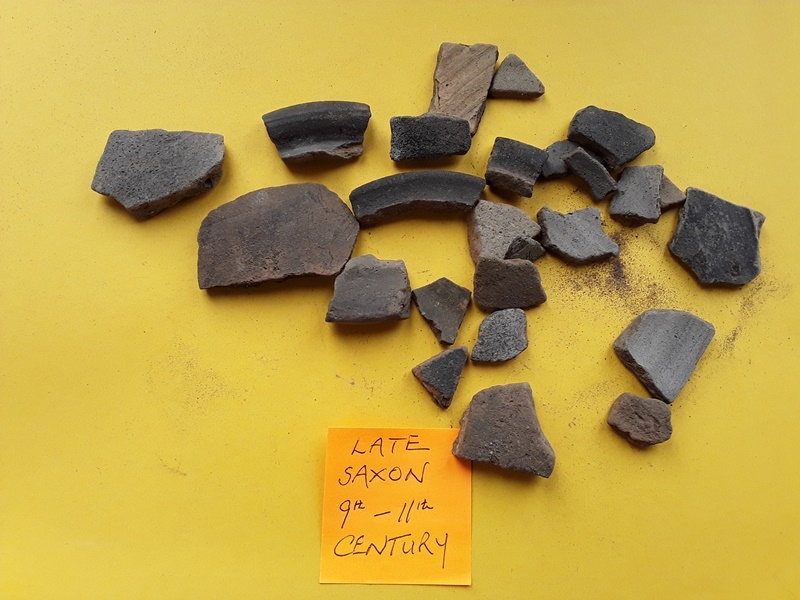 This is Early Saxon ware, 5th to the 7th century, so probably left by the people of Ellingham. The Viking, or Danish, migrants being later arrivals. These Thetford type jar rims date from the 9th to 11th century; times when huge upheavals were taking place politically. There were Viking raids up and down the East Coast and by the late 9th century King Edmund (St Edmund of Bury) had been killed. Alfred the Great made a settlement with the Vikings giving them half of England which now became the Danelaw. The 9th century is the time during which Kirby Cane will have become established as we have seen here, whilst by the end of the 11th century we had seen 1066 and all that; England was then ruled by the Normans. Further links to this evidence is seen in Kirby Cane church with its, possible, Saxon round tower and its beautiful Norman doorway. The 13th century had seen the establishment of the feudal system in England whilst the 14th century saw the plague called the Black Death wiping out, by some estimates, half the population of England. We have a present day link to the end of the 14th Century; tucked away in the Norfolk Record Office is a deed for land given in 1392-3 for the use of the villagers of Ellingham. We see this land mentioned again; in a deed dated 1st March 23rd Henry 8th, or as we might say, 1st March 1532, where we see an enclosure named Dulles being given as gift and grant to Richard Chamberlain and four others. This gift and grant was to the use and benefit of the parishioners of Ellingham viz, to the discharge and payment of subsidies, taxes and other burthens which should be given to the King. (Norwich Record Office Box 4) This deed shows that in 1633 the land was granted, in trust, to John Childs, Robert Bonfellow and 21 others and their heirs with the same conditions concerning payments out of the rents and profits. Today we see this in the Kirby Cane Charity records as the Bonfellow Charity but it seems to be lost in the Ellingham United Charity Records. There are some additional really nice snippets of history of our two villages from some very comprehensive research recorded in “A Chronology of Ellingham & Kirby Cane”, Jo Gooderham 2000. This can be found here and we can now begin to add more of the names of villagers to the story; who knows, perhaps some of the pottery here was handled by one or more of them.